Today, we isolated plasmid that contained antisense and sense sequences of the allergen panel and introns PME and PAL that we grew last week. Should obtain plasmids containing the complete sequence for amiRNA. The resulting concentration should be relatively high (<100ng/μL) because all growing bacteria would have the plasmids inside. We used 2μL of DNA per nanodrop. Diagnostic digest of amiRNA plasmids Digested 200~500ng of plasmids with EcoR1 and Spe1. We will then run the digested vectors on an E Gel and look for DNA that is the length of the insert. If such DNA appears on the gel, then we will send it off to be sequenced. phannibal and pkannibal Extracted vectors from a piece of paper per instructions. Transformed vectors into E. coli. Miniprep and PCR to extract PDK intron. Inoculated 7 Barstar and 3 NLS colonies from Thursday's ligation. 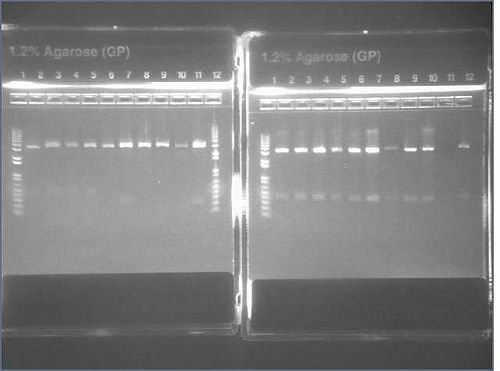 Performed PCR on LacIn (E10) following standard PCR measurements as previously described. Digestion successful, larger bands removed for gel extraction. Gel extraction performed according to QIAgen gel extraction protocol. The 'tag' biobrick (either YFP or STREPII) was used as the vector; Miraculin and Brazzein were used as the insert. The gel showed DNA fragments consistent with Miraculin and Brazzein. The digestion of B21 appeared to be succesful, but the DNA sequence cut out was too small to see on the gel. 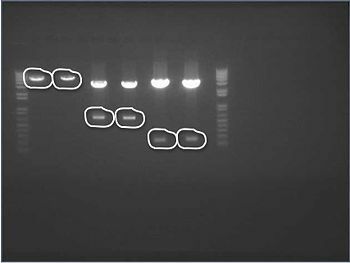 We extracted the circled bands and gel purified the gel per the Qiagen gel purification protocol. We did 6 different ligation reactions. The chart below shows the different reactions. Ligation reactions were left at room temperature for 15 minutes. We mixed 5μL ligation mix with 15μL Turbo e. coli cells. These were placed in ice for 30 minutes and then heat shocked in 42°C water bath for 30 seconds. The cells were placed back on ice for 2 minutes. 170 μL of SOC broth was added to each Eppendorf tube. The transformed e. coli were then plated on LB Ampicillin plates and left in the 37°C incubator overnight. This page was last edited on 26 September 2017, at 19:07.